For more than 30 years, this Lancaster Dentist has been honored to provide the community quality dental care with a modern and friendly touch. Dr. Nelson and his dedicated team set out each day to make patients smile through offering gentle dental treatments to bring healing to mouths and add beauty to the patient’s faces. Dr. Nelson is a Lancaster general dentist with significant interest and experience in advanced dental technology. A particular source of pride for him is his CEREC system, which allows Dr. Nelson to offer fully fabricated crowns and bridges in one visit; Dr. Nelson is an expert and mentor in its use. Patients love CEREC as it significantly cuts down the number of dental visits needed for crowns. At Theodore R. Nelson, DDS, PC our team believes that our patients deserve the best in every dental procedure we provide. This level of quality is especially important in the various supplies we utilize. From the hand pieces and tools Dr. Nelson uses to the prostheses and whitening trays you take home with you, the quality of these items matter significantly for effective, long lasting results. Our Lancaster dental practice makes sure to only use the highest quality tools in dentistry. All products we offer are manufactured by companies and laboratories whose work has been tested rigorously with proven results. We use US manufactured products when possible. 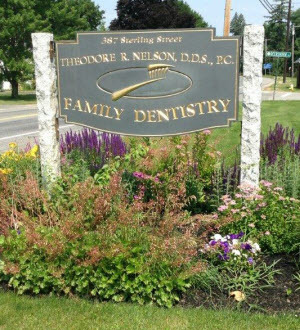 Theodore R. Nelson, DDS, PC provides family general and cosmetic dentistry in the Lancaster - Clinton area. We are conveniently located on Sterling St. (Route 62) in Lancaster at the corner of Deershorn Rd., near Chace Hill Rd., easily accessible for those coming from Sterling and Clinton. We are proud to also serve Worcester and Leominster families! To find out more information about how our practice can help you, or to schedule an appointment, contact us at our Lancaster MA dental practice today!